This is important information. Please read all of it! I hope you are all looking forward to the South Delta Jazz Workshop as much as we are! We have a great week of music, learning, and fun planned for everyone. The workshop begins Tuesday, July 7 at 9:30 am. We will meet at Delta Community Music School, 4705 Arthur Drive, in Ladner. There is a parking lot is across the street next to the lawn bowling green. Please do not be late as we will have a lot to do on the first day! Parents of younger students, please plan to stick around for the first 10 minutes or so. As usual we have a wide range of students from beginner players through to very advanced semi-pro players. Students will be divided into ensembles to work with on the first day. Placements may change as we get to know your abilities, needs, and personalities. Please be patient with us as we try to create a situation that will be best for you. Our full-time faculty members will rotate among the groups on a daily basis. We expect a high level of courtesy and respect among all participants in the Workshop. extra reeds, valve oil, patch cables, picks, strings, staff paper, pencils and eraser. Drummers, bass players, and guitarists are requested to bring their own amplifiers and drum kits where possible. This equipment can be left at the workshop for the duration. The Music School is locked and has an alarm. If you don’t have an amplifier or drum kit please contact us immediately so we can try to arrange to get one for you. We will have music stands available – no need to bring your own stand. Make sure all of your gear is labelled clearly so it doesn’t get lost. All students should bring a lunch, a snack or two and a water bottle.There is very limited time for students to purchase a lunch from the mall as lunch time is also concert time with our guest artists and faculty and all students are required to attend the these concerts. Food is important for an event of this kind. We strongly suggest that you bring something healthy that will provide you with the energy you will need for a very full day of music making. PLEASE NOTE – we have some students with severe nut allergies this year. In consideration of their health and well being, we ask that you please do not bring foods which contain nuts. 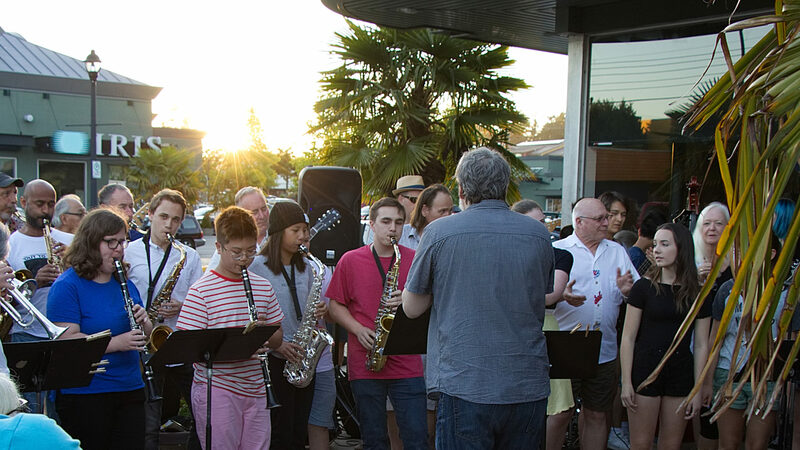 Wednesday, July 8 Advanced Student Concert at Diefenbaker Park 6:30-9:00pm Some of our advanced students will be performing at Diefenbaker Park in Tsawwassen. Bring some food and a lawn chair and enjoy a summer evening with great music. Attendance is not required, but encouraged. Thursday, July 9 from 7-9pm Jam Session at Petra’s Arts Kafein Tsawwassen. This is open to workshop participants and to anyone in the community who plays jazz. This is a really fun part of the workshop and always a highlight for students and families. If you don’t know what a jam session is or how it works, DON”T WORRY the workshop will prepare you for it! Saturday, July 11 Final Student Concert 12:00- 3:00pm at the School Grounds.Parents, spouses, family and friends are all welcome to this concert or any of the noon hour shows. Admission to noon shows and final student concert is FREE. Rehearsals on Saturday will run until 11:30 and then we will be setting up outside for our final performance In the small park area between the school building and the youth centre. Picnic supplies, blankets and lawn chairs will come in handy. Please contact Brad Muirhead if you have any questions by replying to this email. We look forward to working with all of you!